The loud and invasive grinding sound of organic Arabica coffee beans begins at 4:40 a.m. Oh how I wish I could smell the coffee from the comfort of my bed; the aroma would make getting up more pleasant. Less than five minutes later, the dark bedroom is illuminated by the strobe like light flickering from the alarm on my iPhone. “Closer,” one of my favorite songs plays softly in the background. The soothing music is a stark contrast to the bright flickering light. A light that would be startling to the unexpected sleeper, but my sub-conscience reminds me, even while sleeping, that I will be awaken by the light. A visual that moves me to get out of bed. I am pretty much a morning person, so rising before sunrise isn’t usually an issue for me. I admit though, it is easier to get up when it’’s warm outside and the sun-rays play peek-a-boo through the curtains and blinds. This morning started the same as any other. Except, after I sipped down a freshly brewed cup of coffee, showered, applied my make-up, and styled my naturally curly hair, did the phone ring. I wondered who was calling so early. “Good Morning! This is the Atlantic City Public Schools, due to the inclement weather, we will be operating on a two (2) hour delayed schedule today….blah..blah…..” Everything else is muffled and fades into the background! Are you kidding? I’m dressed already! The call came in sometime around six, but it was too late. My curls are poppin and I don’t dare lie down and flatten them. So now what? “Get over it girl!” I tell myself. Facebook, Twitter, and Pinterest entertained me for a little while, but then I started craving real food. And since the delay meant that instead of arriving at school by 7:40 a.m., I joyfully didn’t have to show up until 9:40 a.m. Sweet! Instead of being consumed by something that I had no control over, I moved on. It is so simple, especially at the start of our day, to let some ridiculous incident dictate the attitude for the day and wine about it to anybody and everybody who will listen. Yup! Been there, done that. I am thankful for the extra two hours this morning. After playing around and reading online for a few, I was overcome by an unusual craving for shrimp. That’s right, a shrimp craving at 6:30 in the morning. Noooooo! There’s no baby in this oven. That chapter is over. I ran to my kitchen and cooked exactly what I wanted. Shrimp! I enjoyed the most delicious home cooked breakfast in a long time! 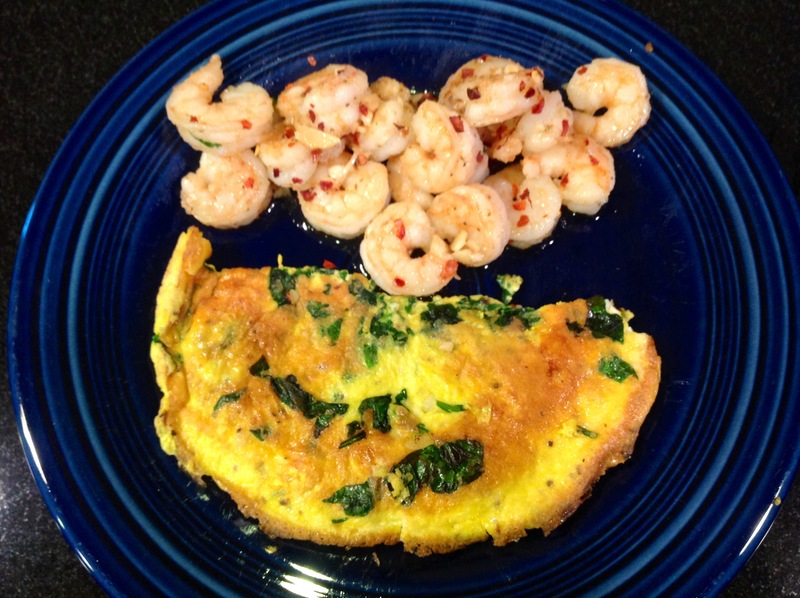 I lapped up the spicy sautéed garlic shrimp and a spinach omelet! I tried my darnest to savor the smell and to enjoy every bite of my breakfast, but I couldn’t resist. I had this delicious food on one of my favorite pretty blue dinner plates. I was supposed to sit at the counter enjoying breakfast like I was at a nice restaurant. Instead, I ended up with the plate in my hand, off the counter, and up to my mouth sucking up the remaining garlic slithering around in olive oil and crushed red pepper. As my son would say, “Mom, you’re going to the chair of shame!” Lol! I am happy for the delayed start; it made my day even better than planned. In addition to eating an awesome breakfast, I also cooked my son and hubby an omelet and even made time to stop at the supermarket to complete my “after work” errands before I even started work. Nice! I hope that you enjoyed your day today and that you will have an ever better day tomorrow! This entry was posted in Family Living, Healthy Eating, Inspiration and tagged arabica coffee beans, egg omelet, healthy breakfast, natural hair, shrimp, spinach omelet. Bookmark the permalink. Thanks Shawn! A small chunk of time can make a world of difference! Lol! Glad you enjoyed and that omelet and shrimp looked delicious!!! I wish I had time for the shrimp this morning….just looking at the picture makes me want more. Thanks for stopping by!